MISO is seeking stakeholder guidance on how to forecast the probable locations of future renewable, energy storage and distributed energy resources in order to better inform its transmission planning. To prepare for MISO’s 2019 Transmission Expansion Plan modeling, stakeholders had asked the RTO to update probable utility-scale renewable zones, map out future storage placement based on likely economic benefits, create an electric vehicle siting methodology and gather more information on DER through forecasts of customer-driven adoption and surveys of load-serving entities. “Some of these categories are relatively new to our MTEP process,” MISO Senior Policy Studies Engineer Jordan Bakke said. James Okullo with MISO’s policy studies group said MTEP 19’s utility-scale renewable study, prepared by Vibrant Clean Energy and used to predict future renewable siting, may include areas outside of the RTO’s territory. “We cannot ignore the impact of our neighbors and what’s happening outside of our footprint,” Okullo said during a Sept. 29 MTEP 19 workshop. The RTO’s current MTEP siting methodology allows for siting of about 50 GW of new wind projects and 9 GW of utility-scale solar expansion in the footprint over the next 15 years. Okullo said MISO would also examine which states have opened state-owned land to renewable project siting. ITC Holdings’ Cynthia Crane asked if the RTO would want utilities and states to supply information on county efforts to stifle renewable siting, pointing to residents in Michigan’s Thumb region that are actively campaigning against new wind farms. Okullo said such information would be useful to MISO planners. 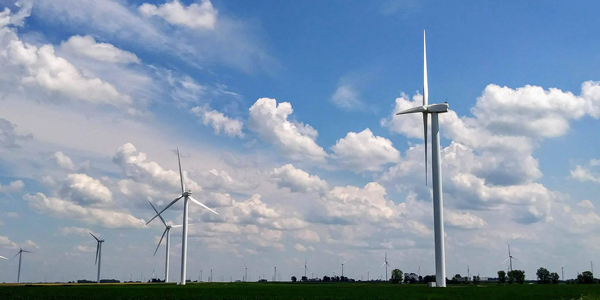 After stakeholders suggested the RTO rank its states in order of receptivity to renewable development, Indiana Utility Regulatory Commission adviser Dave Johnston cautioned against such a political exercise. “In a state like mine, you wouldn’t think we’d be very open to renewable development, but we’re very into economic development and manufacturing, so we welcome those plants. So it’s hard to paint states in certain boxes. It’s hard to predict,” he said. In MTEP 18, MISO projected the siting of 2 GW of future energy storage in its future with the most aggressive growth of DER. It also placed no more than 100 MW of energy storage at any single load bus in the next 15 years. In MTEP 19, MISO could predict greater penetration by studying the full range of storage benefits, engineer Kunjal Yagnik said. Wind on the Wires’ Natalie McIntire asked why MISO would include energy storage in MTEP resource assumptions when storage could very well solve transmission needs and become a project recommendation itself. “It seems like it could serve both functions,” she said. MISO officials agreed. Ann Benson, a MISO policy adviser, said the RTO is looking for better ways to increase DER visibility in MTEP siting. She asked stakeholders for ideas about how MISO could prepare a more complete database of existing and anticipated DER locations. Marcus Hawkins, director of member services for the Organization of MISO States, advised MISO against using footprint-wide assumptions for DER trends, noting that in listening to recent discussion from stakeholders and regulators, he’s heard a clear preference for a state-by-state differentiation of DER assumptions. If appropriate, MISO could also forecast use of other emerging technologies, MISO policy studies staffer Temujin Roach said. Those could include small hydropower resources near rivers and lakes, small modular nuclear reactors and compressed air energy storage. MISO will hold two more workshops before moving forward with final MTEP modeling in early 2018. For now, the RTO is asking stakeholders by Nov. 1 to provide suggestions on how to incorporate forecasts for renewable and new technologies into MTEP modeling and resource siting. A summary of issues discussed by the MISO Planning Subcommittee on April 19, 2016. MISO is recommending the addition of a fourth future to its 2018 transmission planning to reflect localized carbon reduction efforts and battery storage. All storage resources wanting to qualify as capacity should register as behind-the-meter for the 2017/18 planning year, MISO said at last week’s two-day Resource Adequacy Subcommittee meeting.